We’re now approaching the part of Mexico with the difficult-to-pronounce Aztec names. It took a lot of practice to get “Zihuatenejo” to roll off my tongue. I’m presently in Marina Chahue in Huatulco. My last night in Zihua, I got very sick. I awoke in the middle of the night and hurled howling vomits into the head. Because I had no headache, I knew that I had a case of turista, or Montezuma’s revenge, instead of a mean hangover. I knew I’d have trouble convincing the rest of the boat of this and I knew that I’d wake them with my bellows. I usually know the instant that I lay my head down if I’m going to make it through night after drinking. My head will spin and I can’t fall asleep. When this happens, I test myself by leaning towards the toilet. If the revulsion of being that close to the toilet makes me vomit, then great. Out comes the bad stuff and I immediately feel healthy. If it doesn’t, then I tough it out and drink lots of water in the morning. This time was different. This was a stomach-sickness, not a head-sickness. My stomach was trying to expell everything, in whichever direction it could. Even when it was empty, it tried to push out more–the miserable dry heaves. I went back to sleep and repeated the process in the morning. I was dead weight the next day. I slept nearly the whole day and ate almost nothing. The fear of having to expell food in an unpleasant manner killed my appetite. The next day, however, I was more or less back to normal. It took 48 hours to sail to Zihuatanejo, what once was a quiet town just east of Ixtapa (the Pacific’s version of Cancun) and a couple hundred miles west of Acapulco. Although the population of the successful town has steadily increased in recent years, the town still maintains a small village feel and is worlds apart from hotel high-rise Ixtapa. When the sun was rising and Zihuatanejo on the horizion a mere 20 miles away. The wind came to a standstill. Actually, it blew just enough to be annoying. I was alone at the helm and jib got back winded ever so slightly. It wasn’t much of a problem because we weren’t moving–just annoying. I turned the helm all the way to the opposite direction, but the sail would not correct itself. There was not enough momentem for the rudders to even have an effect. Frustrated, I fired up the starboard motor. No sooner had I started it, I heard our fishing pole start to reel. Initially I was thinking, “we caught a fish!” I turned around to see the fishing line pointed down to the propellor. Because the boat turned and there wasn’t enough speed, the line was underneath the propeller and got tangled when I started the engine. It took two days to sail from Los Cabos to Mazatlan. The wind was coming from the South and it was a nice beam reach almost due East. It was just the three of us: Gary, Larry and me. I thought it would be more taxing with less crew, but it wasn’t a problem. The wind came and the wind went. I can’t really keep track of what it does anymore. If it’s too slow for too long and we lose our patience, we motor a bit, but not too much. Sunday night marked the end of the Haha. There was free beer and an awards ceremony in the parking lot of the Cabo marina. Every boat was reckognized and the lowest award given was 3rd Place. There were a lot of ties for 3rd Place in every division. All it took to win, apparently, was sailing the whole way, because so few boats had the patience. Most boats fired up their motors, especially for leg one. Crystal Blue Persuasion actually came 2nd in our division because we sailed the last two legs. Other goofy awards were given like Worst Boat Bite (injury), Worst Dinghy Diasaster, Worst Snorer. According the the Poobah, the boat bites this year where pretty whimpy. My favorite was the snoring award because people had to get up and imitate them. My captain was nominated but Nikki was the first to present and didn’t know she’d have to do an impression. From Cabo there are typically three different routes that Haha-ers take: 1) Sail up the Sea of Cortez to La Paz and beyond. Richard and Nikki jumped ship to go there. 2) Sail to mainland Mexico, usually Puerta Vallarta then on down to Zihuatanejo. 3) Sail back up to Alta California known as “bashing back” because you’re going against the wind and current. A forth option would be to park your boat somewhere and fly back. Right now I’m in Mazatlan. 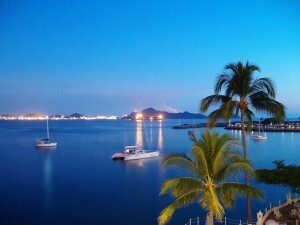 Our next definite stop will be Zihuatanejo but hopefully Puerto Vallarta as well. I’d like to meet up with the super kids on Gypsy that I met on the way down. It seemed most Haha boats going to the mainland were going to PV, including Profligate. Sailing here, however, we were almost side-by-side with Thumbs Up, so we are not the only ones in Mazatlan. The Grand Poobah announced that the start of leg two to Bahia Santa Maria would be a “rolling start,” meaning all participants motor out a bit to catch wind until a deadline to kill the engines was announced. A half hour later the wind was blowing generously and the Poobah gave the order to kill the engines. We killed the engines and started to cruise. The conditions had been the best of the whole trip at that point and, according to the weather report, it would last at least till our next stop. We cast our fishinglines to see if anything was biting. We caught a tuna on leg one, which we already devoured. 30 minutes into leg two the line started zipping and Gary reeled in a fish. It didn’t resist much and turned out to be a 20 lb. dorado. I’d never heard of that fish before then Nikki told be it’s called Mahi Mahi in Hawaii, which sounded familiar. Nikki eventually cooked it into something delicious with the random rations we have aboard.